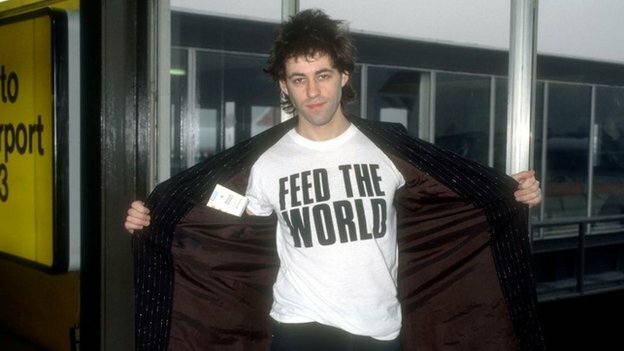 Thirty years on and Bob Geldof has rolled out the latest incarnation of his star-studded charity drive, Band Aid. The latest rework of Do They Know It’s Christmas? is both a showcase of, and a gleaming opportunity for this generation’s stars to cement their names in what has become a kind of pop hall-of-fame. And vitally, with all proceeds again being directed into dealing a blow to a localised humanitarian crisis that desperately needs international exposure and aid, it’s hardly surprising that it seems to be surpassing even Geldof’s ever-ambitious expectations. With over 200,000 digital downloads in the first 24 hours, 312,000 in the first week, and purported sales of over £1 million within minutes of its release, Band Aid 30 boasts the biggest first week sales since X Factor’s James Arthur back in 2012. And yet, not for the first time, this apparently noble venture has come under fire from a variety of outspoken critics. But why does Band Aid persist in polarizing opinions? Well firstly there’s the song itself – did we not deserve a new one this time? Emeli Sandé, amongst others, has suggested that it could have been changed more (and vastly for the better), and many will maintain that despite its impressive production value, it was and still is just a mediocre song. The lyrics of the original have long since been criticized for being clumsy and, at times, tasteless (‘tonight, thank God it’s them instead of you’?). Sadly, the new lyrics do little to improve on this (most of the victims of the Ebola outbreak are Muslim, for example) and some have argued compellingly that it perpetuates a brutally antiquated world-view. Secondly, we have an entrenched scepticism of celebrity activism and understandably so. It can come across as smug and patronising, and the guilt trip element is always there – with this year’s message delivered live on prime-time family show X Factor in such a visceral and emotive way. This time around Band Aid has faced an apparently unforeseen problem in the difference between the original ‘product’ and the new: despite record sales and units sold, these have so far been 99p downloads, compared to sales of a physical single priced at £3.50 in 1984. Geldof himself has urged customers to delete and re-purchase the song without realizing that iTunes will only let you re-download a track rather than pay again. But all is not lost: no doubt the release of the CD single (priced at £4) just in time to clinch that Christmas number one spot will surely push revenues through the roof. Band Aid has been defended as such: it’s not a song for victims to sing along with, its purpose is to compel donations. We must agree that it’s not the worst song ever, and it’s definitely nowhere near the most offensive, and the proceeds go to a good cause. Whether you give in other ways or not: it’s more money for charity. Would every single one of those people downloading it otherwise give that 99p to charity? Sometimes it can be too easy to get caught up in the cynicism and watching celebrities fiercely vying for the moral high ground that we may lose perspective. In the same way as the poppy appeal, people are not without their misgivings (and anyone giving their reasons ‘to be excused’ should remain unscrutinised). Band Aid, and the song itself, is a symbol of good will, but do the ends justify the means? In this special case we may be inclined to accept that it’s the cause that matters here, rather than the personalities, the approach or even the quality of the music.